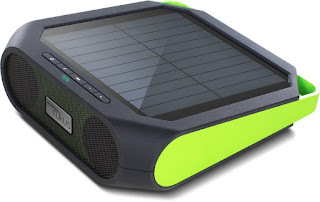 Take your music with you everywhere, the sunshine will power the rukus to keep your tunes playing. If your phone starts to die, no worries, plug it into the rukus to get a charge. When it gets dark, the internal lithium battery will keep the music going for hours or you can use the included USB cable for non-stop songs. Stream all your music from almost any Bluetooth-enabled smartphone, tablet or computer. And for non-Bluetooth devices, there's an aux-in. It’s time to start a Rukus! IPX 4 rated - Rugged and Water Resistant for go anywhere audio!